Neptune is a planet that is very fluid. Neptune was the Roman god of the seas. She rules the oceans of the Earth. The planet is fickle and has a nature concerned with illusions. She controls dreams and illusions. She is concerned with thinking in an abstract way and things that are mysterious. The planet Neptune will value the spiritual feelings of people. She will want people to use her energy to improve their lives. Neptune will want people to use her energy in a meditative state. She wants people to be more aware and to have new insights. She enjoys poems, music, and dance. Neptune has a side that is more dramatic. She will rule over all things dramatic like movies, theatre, and television. She is also a planet of glamor and will rule over fashion. Neptune essentially makes a fantasy. She will make a fantasy that is charming on the outside and fascinating on the inside. The planet is mysterious and will not show her mysteries easily. She is good with flattering comments but they might not be sincere. She might have a hidden desire for sabotage. Neptune has a darker side that will be hard to discover. In the dark, she will take part in an underworld of drugs and alcohol. She will be interested in hypnotic trances. The planet has an energy that will push her to be elusive on her less bright days. She can be neurotic and bizarre and very good at deception. The planet Neptune will control sleep and dreaming. She has her hand in a lot of every day things in life. Neptune will take 165 years to complete its orbit of the zodiac. She spends about 14 years with each sign. She rules over Pisces and the Twelfth House. The planet is the octave above Venus. In the group of transcendental planets, Neptune is the second one. Neptune is a planet concerned with stimulation and dreams. She is about deception and distraction and being open in a psychic way. The planet controls subtlety and spiritual natures. Neptune will make the people she rules over seem young and innocent. 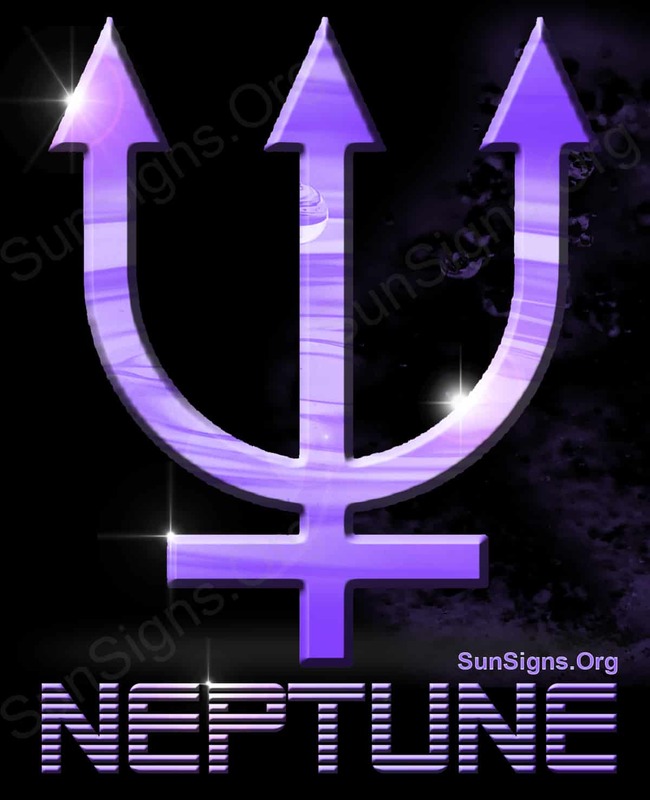 However, Neptune is connected with instinct and spiritual understanding. The planet is about being kind and having grace. However, Neptune can have negative traits of betrayal, deceit, disgrace, and addiction. Neptune has a symbol that looks like the trident of Neptune in mythology. The crescent will symbolize receptivity. It points to the sky which symbolizes spiritual receptivity. It is above the cross of matter. It represents the soul having a desire to break away from the constraints and restraints of reality. Neptune’s trident will have a few different meanings. It will symbolize the life cycle, from birth to life to death. It will represent the three parts of a person, from their mind to their body to their spirit. It will symbolize time, past, present, and future. Neptune can represent dreams, instincts, and psychic capabilities. She will symbolize creation, illusion, and being aware. She represents theory, attitude, and being strange. She will represent being mysterious, and the fantasy and the occult. She can represent both feeling and the darker side.